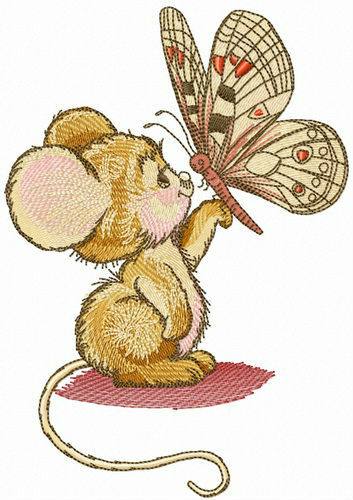 Celebrate true friendship with this amazing machine embroidery design coming up next in our mice collection! 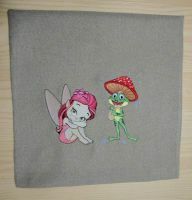 The needlework features two besties, a beige mousekin and a butterfly. The colorful butterfly has gently landed on the mousekin’s paw. The pastel color palette is a combination of auburn, saffron, almond, sand dune, mountain rose and visor gold. 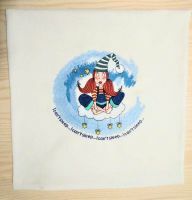 This creative application will be such a lovely addition to any of your favorite belongings such as hoodies, T-shirts, pajamas, blankets, towels, cushions, quilts, bed linen, gift boxes, onesies, napkins and much, much more. very pretty plot! embroidered the digital design on a t-shirt for my niece. this is her favorite shirt now. she also asked me to sew a pencil case for her using the mouse with butterfly design. 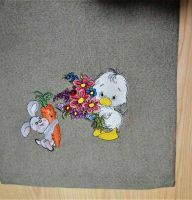 looking forward to sewing the gift for my little friend) Thanks to the designer! I just purchased some embroidery designs.Order # 16925. I was checking to see if it was possible to get “Mouse” in pes. a little smaller? My error,, did not check the size. I have a BabyLock Flourish ll, I do not have a large enough hoop for that size desigen.Checking to see if you could help. What size you need? Please send request via Contact us form. Stitched out beautifully for my granddaughter's shirt!